What's the most popular color during the holiday season? Red, of course! From Santa's ensemble to Rudolph's nose, red is one of the most cheerful Christmas colors and a classic choice for holiday lighting too! Red LED Christmas lights are energy efficient, long lasting and look amazing in almost any setting. Decorate with Red LED Christmas lights outside by wrapping trees with red mini lights and lining the roof, walkway and driveway with C7 & C9 red LED bulbs. Red icicle lights look amazing hanging from the porch or across the roof and down stairways and railings too! In addition to their outdoor applications, red LED Christmas lights work great for indoor holiday decorating as well, especially against Christmas greenery. Wrap red LED Christmas lights around wreaths, garland and your Christmas tree to add more of this joyful hue to your home during the holidays! Pair red LED lights with white and blue to create a patriotic light display during the Fourth of July or to share your love for your country year round. Hang red, white and blue icicle lights along a fence or above an outdoor patio and illuminate a bar or indoor event space with patriotic themed mini lights. For patriotic lighting indoors, create a centerpiece or accent light by filling mason jars with red, white and blue battery operated LED lights. Mix red LED lights with green to create a bold Christmas display with the most classic colors of the season! 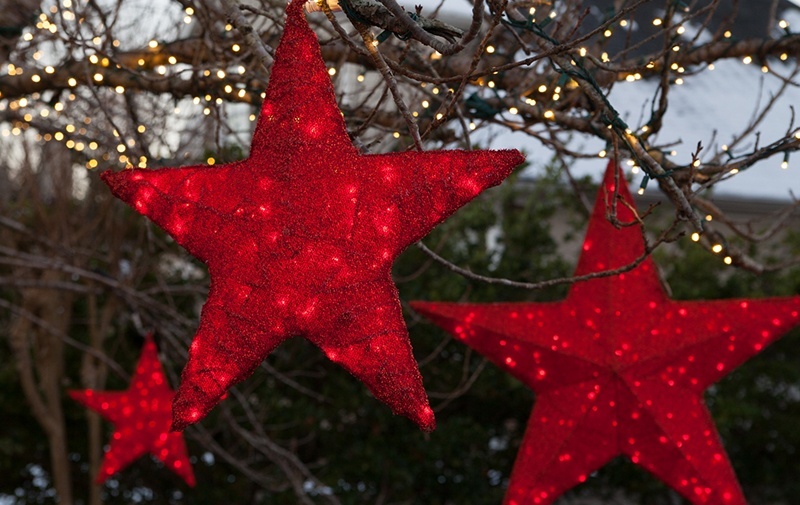 Hang red and green light balls and moravian stars from tree branches, wrap tree trunks with red and green LED mini lights and add coordinating C7 or C9 LED light bulbs across the roof and along the driveway. Inspired by candy canes, red and white lights are one of the most popular color combinations and a sweet addition to any Christmas display. Alternate red and white bulbs along the roof, hang red and white LED icicle lights along porch railings and wrap bushes and shrubs in coordinating net lights! You can continue the candy cane theme throughout your yard by wrapping trees with red and white LED mini lights and hanging moravian stars and light balls from tree branches!